Obtaining a Work Permit or Authorization to Work in U.S.
How can I get a work permit or authorization to work in the U.S.? 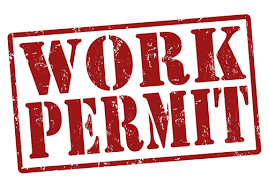 Generally, in order to be able to apply for a work permit, you have to have an application pending with immigration that allows a person to apply for work permit while it is pending, or you have some sort of status or visa in the U.S. that allows you to apply for a work permit. You cannot just apply for a work permit to work legally in the U.S. on its own. There are many ways to qualify for a work permit, and it is determined by the category listed on your employment authorization card. Work permits are also called Employment Authorization Documents (EAD). A work permit is a card with the individual’s picture and name, usually valid for either one or two years, which allows them to work lawfully inside the U.S. during its validity. With a valid work permit, you can apply for a social security number with the social security office, which is only valid if you are able to show a valid work permit at the same time. Each application is $410.00, and it is not refundable if the application is denied. This fee is only for immigration and does not include any attorney’s fees if applicable. How can I qualify for a work permit? There are over 50 categories in order to get a work permit, but some common categories are: temporary protected status (TPS), pending adjustment of status (Green Card application), order of supervision (appointments with immigration), pending asylum application (if the asylum application has been pending for over 150 days). However, in order to see if you may qualify, you should consult with an experienced immigration lawyer.